Bruno Drwęski is a historian, a political scientist, the director of the Polish section of the National Institute of Oriental Languages and Civilizations (INALCO), and a member of Sorbonne University. He is also general secretary of L‘Appel Franco-Arabe, former chief editor of La Pensée, author of the publications La Nouvelle Alternative, Outre-terre – Geopolitical Affairs, Revue d’études slaves, Studia Politologica (Annales Universitatis Paedagogicae Cracoviensis) and Utopie critique. He is also director of the journal La Pensée libre. How would you describe the current protests taking place in France from an ideological point of view? Are they an expression of a class struggle? Objectively, they are definitely a class struggle since this is a protest of working class and lower middle class people against inequality and the elites. But it started mainly in the peripheral regions of France which have been marginalized by almost thirty years of neo-liberal western European and then European Union policies. 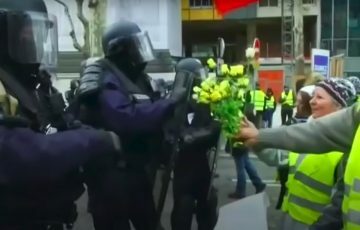 Even if this protest is supported by seventy to eighty percent of the French population (as it is, according to the polls), its main core is centred around what in classical Marxist jargon we can call the depoliticized petit-bourgeoisie, and sometimes it might look a bit classless because of that. The main cities and districts are less active in this movement than the peripheral regions, and local industry workers are more active than the ones from major industries. But it is still quite spontaneous and still a class movement. Some analysts fear that the neo-liberal measures taken by Macron will pave the way for Le Pen. Do you agree? For years the strategy of the ruling class in France was to push unsatisfied social groups and classes in the arms of Le Pen. She does not criticize the dominant system, so she’s pretty safe. But this does not work very well any more, since Le Pen has no clear message as soon as any protests take up specific social issues. And now the whole movement is obviously about concrete social and economic issues. That’s why, during the last elections, it was possible to see that at the very end of the electoral process France was split into three more or less equal parts: those who were mostly not convinced by their choice but who voted for Macron against Le Pen, those who voted for Le Pen mainly to vote against Macron’s blatant neoliberalism and those who did not vote at all since they could not decide who was their main enemy. Now, since the economic and social issues are back, there is a lot of unity on the ground between large parts of all those groups, who have understood that the Macron/Le Pen rivalry was organized within the framework of the system so as to effectively secure it in the final aftermath of the election. We can see that the protesters really don’t want to recreate those old differences which were used to manipulate people against their own interests. The recent protests have an interesting slogan: “Ni patrie, ni patron, Ni Le Pen, Ni Macron” [Neither country nor boss, neither Le Pen nor Macron]. Are the voices of those protesters still powerful enough? The most radical protest took place in the French de facto colony of Réunion in the Indian Ocean where ethnic and religious differences were defeated long ago and the protesters succeeded in making the government retreat. This had a great influence on the protesters in mainland France. The main problem is connected to the fact that the unions and political left parties are to a large extent in crisis. This explains why traditionally left social groups and districts are joining the movement individually but not as a politically organized force in the way it used to be after World War II. What, in your opinion, is the most brutal of the measures taken by Macron so far? In fact, we have had to deal with brutal measures taken by all three former presidents. Earlier there was the state of emergency when there were more than 5 000 night interventions by police in families from popular [working class] and immigrant backgrounds supposedly with links to terrorism. These later turned out to be not true. We had other examples of human and civil rights abuses such as the so-called “Tarnac affair” where a man supposedly connected to the ultra-left was illegally put in jail for eight months without any proof. We also had two demonstrations of solidarity with Gaza banned during the Hollande presidency and we have had various forms of repression and so-called financial enquiries against opposition parties. Now, most of the state of emergency laws were introduced in the common law at the time when President Macron was praising Marshall Pétain for his role during World War I. Pétain is known for his military activity against the Moroccan anti-colonial movement of Abd el Krim during the twenties and for a pro-Hitler policy during World War II. People now understand more and more that the economic exploitation of the poor through new taxes under neo-liberal pressures is linked to repressive policies against social, ethnic or religious groups which the elites use to set them against each other. How do you see the immediate future of these protests? People are determined not to capitulate but the main problem is the lack of an organized movement. On the one hand this makes the protest broader, but on the other it leaves it open to provocations, manipulations and social divisions. Even if the general mood is marked with values and slogans that were first used during the French Revolution, it is hard to say if this “national-political-social unity” will prevail and succeed in forcing the government to retreat on basic issues that are opposed to the general lines of policies pursued not only by the government but also by the EU and all international financial organizations within the framework of the capitalist globalization process. For example, protesters are asking for an end to “off-shore paradises” which means France would have to radically change both its national and international policies. When people ask for troops not to be sent to Libya or Mali to be able to concentrate against those off-shore territories, it makes things very clear but very difficult to solve on strictly French ground. Some journalists have claimed that the current protests taking place in France are the result of Russian interference in the internal problems of the French people. What is your opinion on that? The so-called Russian interference and fake news are becoming quite funny since people actually watch Russia Today in French because they find there what they feel is true and what they cannot find in mainstream French media. This Saturday, I was at the Champs Elysees when tear gas was being used, and I heard protesters expressing a lot of anger towards mainstream BFM TV journalists but being very sympathetic to the Lebanese TV staff, as they were considered to be the ones who would tell the truth to the outside world. So Russian media do not have to try very hard to be believed – their best advertiser is the mainstream media. How do you see the near future of these protests but also the future of France in the current international context? I think what is happening now in France is an extraordinary “school of politics” mobilizing mostly people from the regions and social groups which up till now were less politicized than others. Listening to them at the massive debates they are holding in the streets, between the tear gas, the water canon and the barricades, I saw they were making really fast progress in their social and political thinking. Almost no racist slogans, but evidence that social and economic poverty is linked to French national and international policies carried out by the French elites against the interests of everyone living in the country, regardless of their origins or ideological representations. It is obvious for everybody now that liberal democracy is in crisis everywhere – so is capitalism, so is the European Union, so is NATO. And all these crises together are globalized. People now understand that links have to be made between local, national and international issues. I do not think, even if history seems to be accelerating at the moment, that the situation will change tomorrow, but I notice that people have already understood a lot during the last two weeks concerning both the general situation and their particular one. And that makes people ready to think about an alternative that the self-proclaimed alternative parties or trade unions were not prepared for. In the end, things are changing, since people understand that liberalism is no longer able to work without repression, and that globalization does not function without endless wars and terrorism carried on in the interests of the military-industrial complex. In fact, people understand “socialism” is the solution, even if to some, the word seems old-fashioned or even senseless. We just have to figure out a new vocabulary to show that Karl Marx’s analysis fits today’s situation better than the situation that prevailed during the seventies, when Keynesian policies could be introduced because capitalism still had reserves it no longer possesses. How was the general atmosphere at the protests? 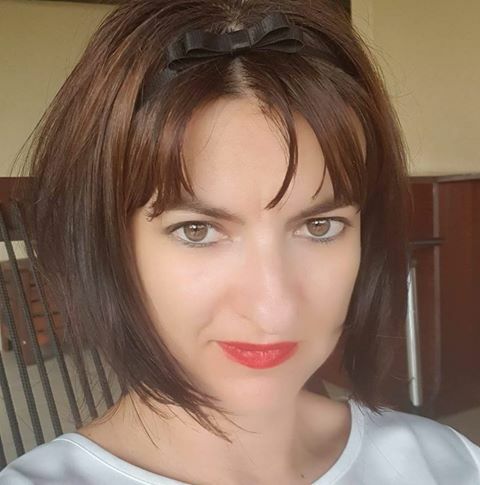 Maria Cernat is a graduate of the Faculty of Journalism and Communication Sciences (FJSC) (2001) and the Faculty of Philosophy (2004) at the University of Bucharest. She obtained an MA from FJSC in 2002 and in 2008 she was made a doctor of philosophy. She is currently a PhD Lecturer in the Department for Communication and Public Relations at Titu Maiorescu University. Since 2011 she has published articles on Romanian websites for political debates (CriticAtac, Cealaltă Agendă, România Curată). Next Post:Who gets isolated by the anti-Iranian sanctions – Tehran or Trump?